Posted on Thu, Feb 9, 2012 : 5:57 a.m. 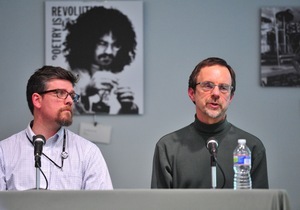 The second of four discussions in the Sustainable Ann Arbor forum series will focus on land use and access when it begins at 7 p.m. Thursday at the Ann Arbor District Main Library at 343 S. Fifth Ave.
Jason Tallant of the city of Ann Arbor's Natural Area Preservation program, left, and Tom McMurtrie, the city's solid waste coordinator, appear on stage January 12 during the Sustainable Ann Arbor discussion series at the Ann Arbor District Library. The forum will focus on transportation designs, infrastructure, land uses, build environments and public spaces. The series is meant to bring together University of Michigan faculty, representatives from community organizations, city commissioners, city staff, and the public to discuss local sustainability concepts and efforts, according to a news release. The first forum in January focused on resource management. The March 8 forum will highlight climate and energy issues, while the April 12 forum is focused on community. Each program will include short presentations followed by a question-and-answer session. Visit www.a2gov.org/sustainability for more information. Sun, Feb 12, 2012 : 2:12 p.m.
Is that a wall photo or thought bubble?